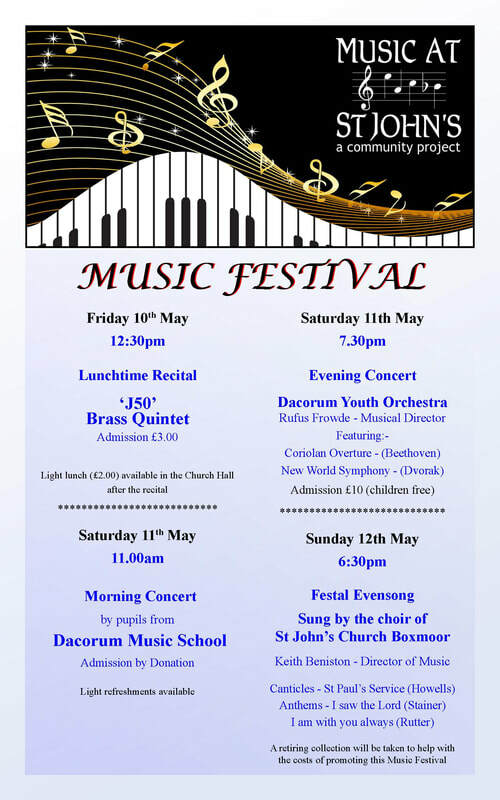 The Friends of Music at St John's support the fundraising activities of this community project by subscribing as members. Anyone can become a member by completing the application form available either at the back of the church or we can send you a copy and a reply addressed envelope. Instructions for completing the form are printed on the form itself. A 'family' can be made up of any related adults and children. For example a mother and her partner could pay £40 per year in total and might include 3 of her children and 1 of her partner's. The subscription rates are reduced to half of the above amounts for full time students. ​OAPs or Dacorum Card Holders. For example, a pensioner could pay just 2.50 per quarter and include his/her 2 grand-children! Subscriptions may be paid annually or quarterly. Quarterly payments must be made by Standing order only. If you are able to set up a Standing Order, this method Of payment has the advantage that your membership will be automatically renewed each year unless you cancel the order. If you are not able to set one up then please enclose cash or cheque with the completed form in the envelope provided. The subscription period starts on 1 January each year with annual subscriptions payable by 30 January. If the quarterly standing order option is chosen then quarterly payments should be made by 30 January, 30 April, 30 July and 30 October each year, In the first year of membership the first payment is calculated pro-rata, according to the number of full quarters left in the year.